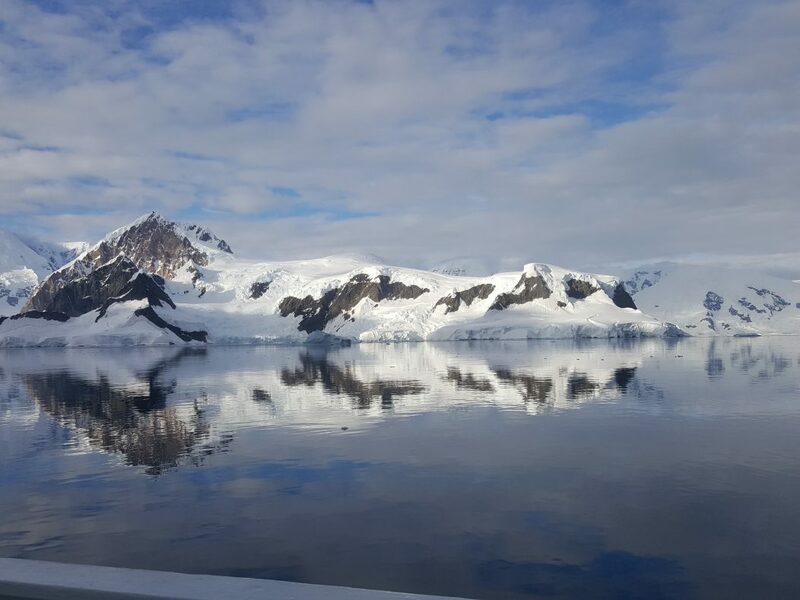 Rob is a Swoop Customer who has recently returned from a trip to Antarctica, which was in honour of a close friend that he and his travelling companion lost to cancer two years ago. Here Rob shares with us his incredible wildlife experiences. Q.What was the highlight of your trip? Our journey provided many vivid memories, such as the morning of our first full day on board. 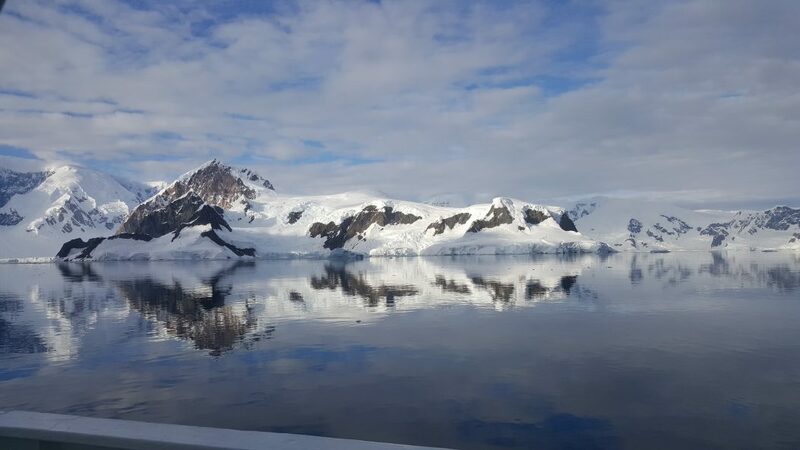 We had sailed through the night from Frei Station on King George Island into the pristine and reflective conditions of Wilhelmina Bay for National Geographic worthy pictures of Antarctic glaciers. 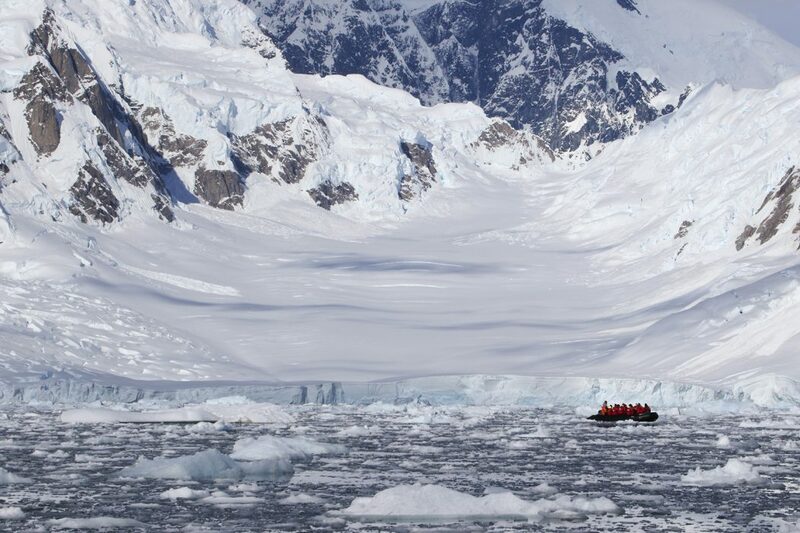 But I think my fondest memory is of my walk on Damoy Point, home to a large penguin population and abandoned British Antarctic Station and ice airstrip. The weather was warm and dry as we set off on the 1 km walk to the station, but quickly turned dark, cold and windy. By the time I had returned to the zodiac landing point, I was in a full-on snowstorm. It would be the first reminder of many that I was part of an expedition, not a pleasure cruise. Q. Did you have any close encounters with wildlife? There were three episodes I will never forget. 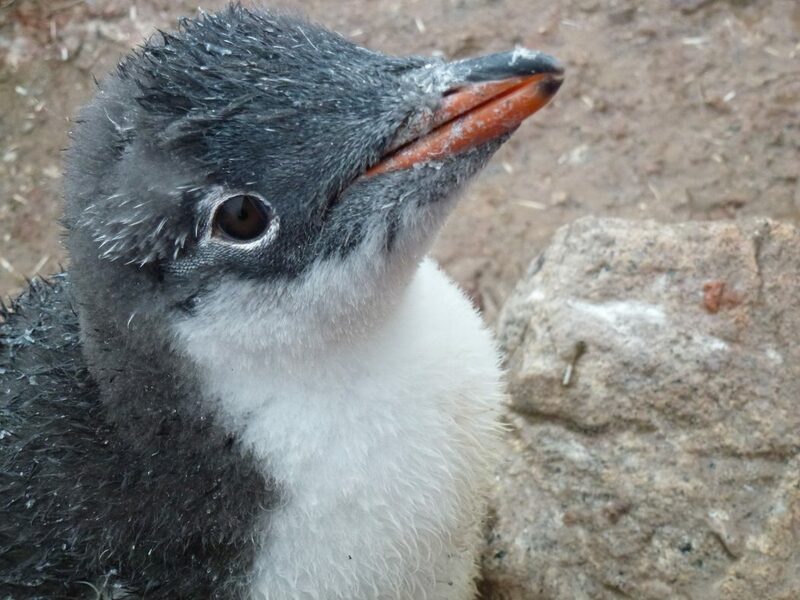 The first was on shore in Neko Harbor, where a young gentoo penguin came up to me while I was playing with my new 360-degree camera. Realising how close it was, I looked to down to see its tiny face imploring me for food or perhaps even some fatherly advice. Unable to obtain either, the juvenile waddled off to better options. 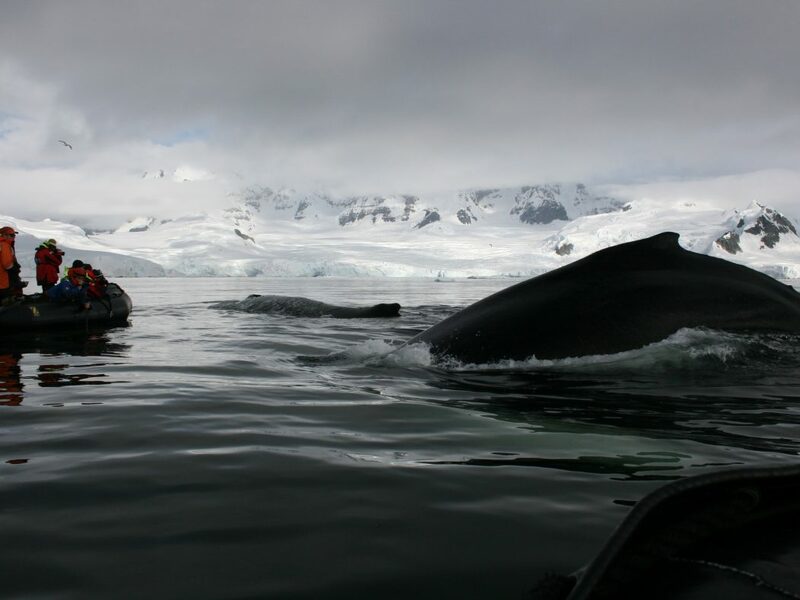 The second close encounter was in Fournier Bay, where the ship nested among at least 20 pods of humpback whales, gorging on krill through a complex cooperative process known as ‘bubble net feeding’. In groups of four or five, the whales would dive together, then slowly circle at depth, releasing air to form a net of bubbles which would carry and concentrate the krill upward to the surface. One of the pod would rise from the center of the circle surface straining up to 15,000 gallons of seawater through its baleen plates to harvest the concentrated feed. I mention the amount of water as a visual, because our little zodiac found itself in the middle of one of these bubble nets, which was a highly dangerous place to be among these magnificent creatures. Luckily the whale was aware of our presence and broke off the normal feeding practice by rising sideways and away from our tiny craft. The last encounter was with a fur seal on Deception Island. As I was passing a yawning seal, I mimicked its rise and head twisting behavior, and in the process unknowingly raised a challenge for dominance! Fortunately, we had been briefed on charging seals and when it barked and approached I stood tall, raised both arms and roared like a lion (the actual advice was to “make noise”), and it worked! The seal stopped dead in its tracks and I slipped away trying my best NOT to resemble a seal. Q. Was the weather kind? On the eighth day of our adventure, the Expedition Leader called all passengers together for a mission update. What little weather forecasting technology that serves this remote area was predicting the formation of a cyclone on the eastern edge of the Drake Passage, three days hence. The impending storm was on our route to the Falklands, and so upon the advice of the Vavilov’s captain we immediately steamed out of the area to what we hoped we would be safe harbor north of tempest. 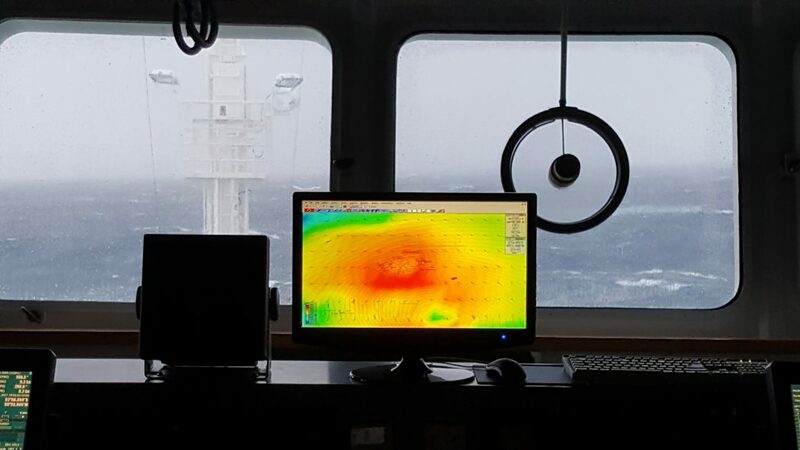 Unfortunately, the storm grew in size much more quickly than the original forecast, and our little ship was tossed about in gusts up to 80 kmph and waves of ten metres and more for over a day. No worries, we all learned how to eat with elbows on the table to keep the plates from sliding off onto the floor, or our neighbour’s laps! Q. What surprised you most? 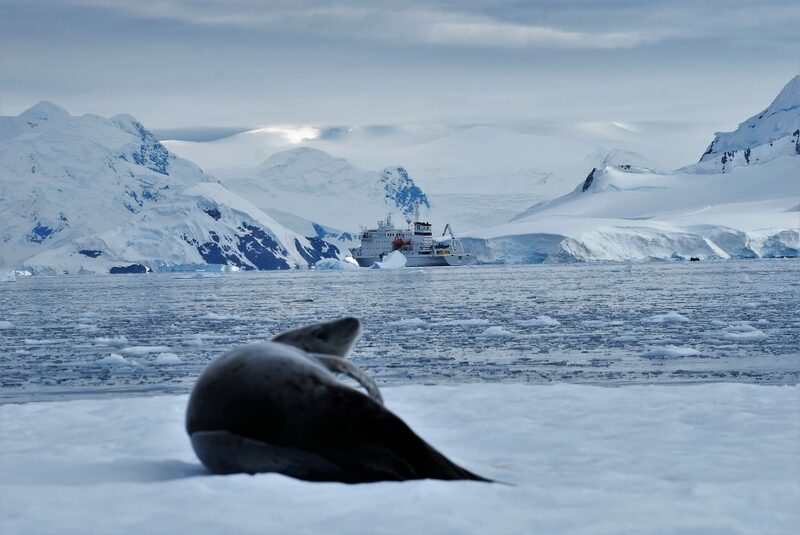 Although it is desolate, the Antarctic is not a quiet place. 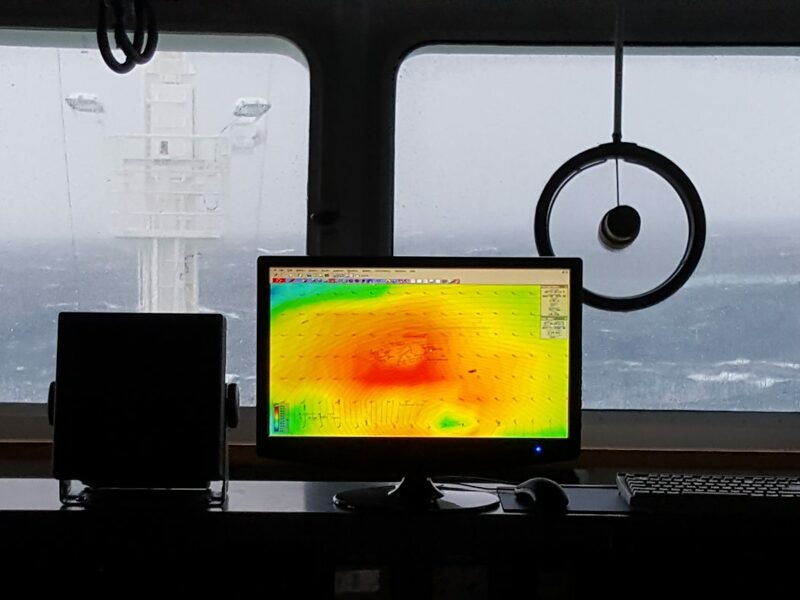 We had one remarkable afternoon in the Bransfield Strait where we just sat in our zodiacs and listened. In the distance we heard the thunderous roar of an avalanche, then the cracking of glacial calving, while all around us 2000 year old air popped liked Rice Krispies as it was released from melting brash ice. Later that day, the sounds of spouting whales added to the cacophony. Q. 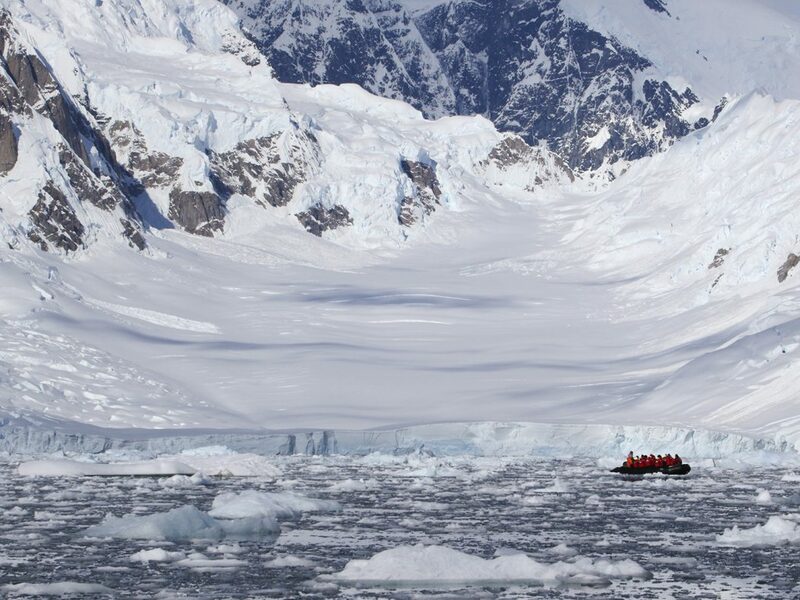 How has your visit to Antarctica made you more aware of the effects of climate change? Climate change is a very complex scientific phenomenon, which is often mistakenly used to describe natural occurrences. It’s very handy to show pictures of glaciers receding as a proof of global warming, but the truth is that earth’s climate mechanism is highly interactive and caused by many variables not easily identified or understood. What the voyage did for me was to underscore that our planet’s weather systems are not fragile, but are reactive – often in a very violent and unforgiving fashion. The earth will not be destroyed by mankind’s efforts to pollute its air and waterways. The earth will take care of itself, but that may be in a way which is inhospitable to humankind. Q. Would you visit again? If so, where would you go and why? 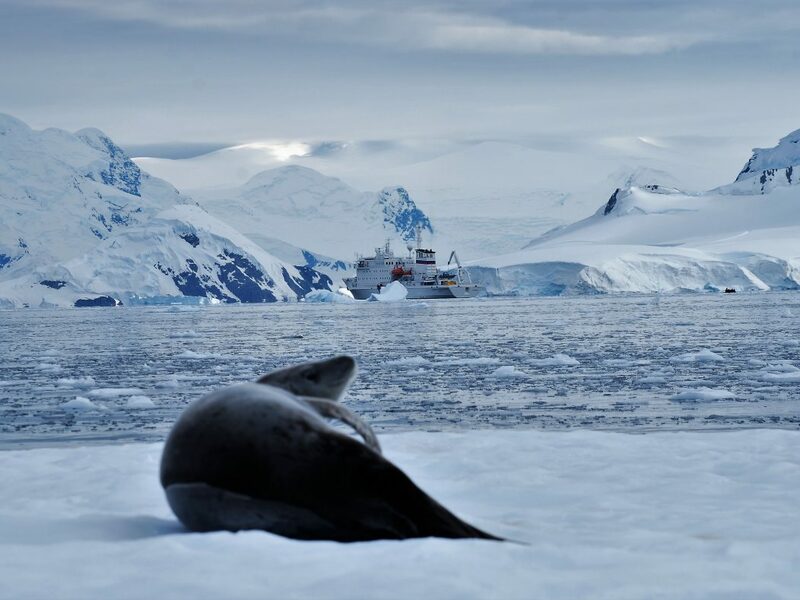 Antarctica is a very special place and the voyage was such a very special experience that it could probably never be repeated in such a sensational way. For that reason, I would not return any time soon, although I would never say never. I would consider taking the same ship on a north Arctic expedition to see different geographies and wildlife, and if I did go back to the Antarctic, it would probably be at the start of the summer instead of the end, to witness a different part of the region’s cycle of life. Q. 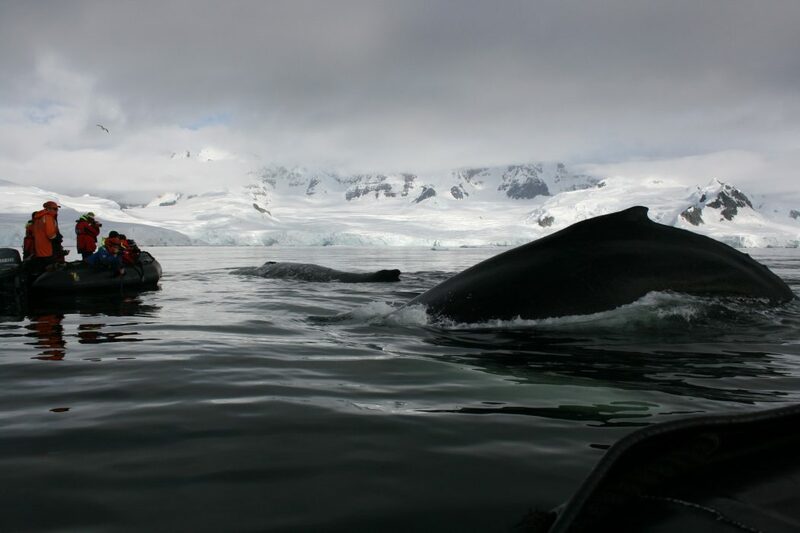 Has experiencing Antarctica encouraged you to see things differently? The size and majesty of the continent reaffirmed that I am a very small part of the complex ecosystem of a small planet circling a small sun within a universe of a billion stars. This experience confirmed that I should do the things I want to do while I am still able, and oh yeah, don’t sweat the small stuff! Rob, a semi-retired energy consultant, describes himself as an explorer-philosopher. He has over 100 countries under his belt and his perfect trip includes an adventure activity. He remains delightfully surprised by how close they were able to get to whales, seals and dolphins on his last trip to Antarctica.